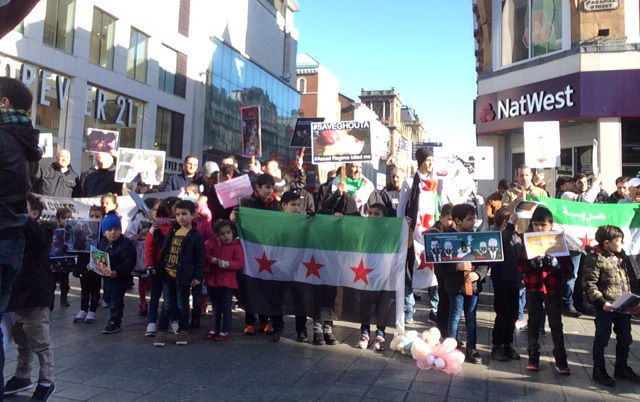 Syrian refugees joined Liverpool shoppers recently, in a peaceful demonstration for Ghouta. The gathering on Church Street was organised by the ‘Syrian Community in Liverpool’. Syrians, from five to seventy year- of-age, held photos aloft of loved ones that they have had to leave behind, many of whom are now dead. After fleeing Syria for sanctuary in Europe, Liverpool has become the final destination for a large community. Many of them had not even heard of the city before arriving from the Dover detention centre. Abdul Majeed, 26, from Kensington, was one of the organisers of the demo. Mr Majeed was in his final year of a degree in electronic engineering when his conscription to Assad’s army arrived. Knowing that this would require him to kill his fellow countrymen, but that refusing to do so would mean his own certain death, he set out across the Levant and Europe before arriving in the UK in 2014, beneath the undercarriage of a lorry. He described how young people from his suburb of Damascus were protesting for freedom against the Assad regime, when they were arrested and tortured by having their finger nails pulled out and their fingers cut off. Ghouta is the latest area of Damascus to be destroyed in the seven year Syrian war. Once a pleasant place with a café culture, plenty of food in the shops, and a vibrant local life, it is now the scene of repeated bombing raids and chemical warfare. There have been 540 deaths reported in just over a week. The mood at the demonstration was sombre. Songs of longing were interspersed with sorrowful chants of defiance. A statement of support was read out from Stephen Twigg, Labour MP for West Derby, followed by a young man who read an impassioned speech, ending with the declaration that he hoped one day to return to his homeland. The final leg of Mr Majeed’s journey crossing the channel, was terrifying. The ‘Syrian Community in Liverpool’ group are planning their next rally in the city centre on Sunday March 18.